Over the Thanksgiving weekend here in Canada my Godson got baptised. With him being a energetic, adorable, and sweet little 6 year old boy I wanted to create something for him that was classic Baptism because the gift I was going to give him certainly was anything other than traditional. His gift was 2 African Dwarf water frogs and I would have loved to have created a card that encompassed that theme, however I did not at that time have a stamp with a frog. So instead I designed a traditional baptism card. When creating this card I wanted to give my Godson a Bible verse that he could turn to while he grows and know how loved, special, and cared about he is. This verse has been one of my favourite verses for years, and I have found much strength in this. I used scrap paper for parts of this card, as it has been something that I have been trying to do since I have TONS of scraps. I cut the large blue piece of paper with Spellbinder Nestabilities Lables Eight dies. 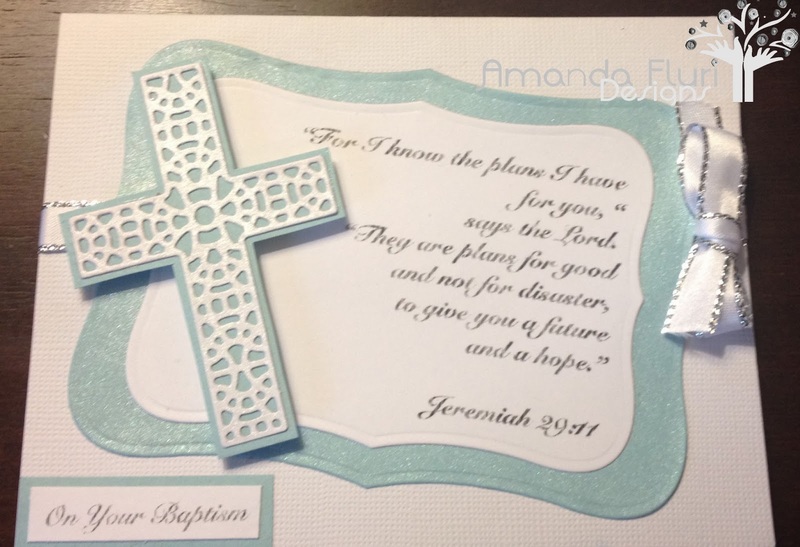 I then typed out Jeremiah 29:11 and printed it on to white cardstock and then also cut it with the same die set. I sprayed the blue card stock that the verse is mounted on with Memories mists - Iridescent and then mounted the verses together. Then used Cherry Lynn Designs Cross Set B207 to cut the cross out of some Bazzill Marshmallow Cardstock which is shimmery paper. I then shadow cut the cross after adhering it to blue paper. I tied a silky piece of scrap ribbon (sorry no link) around the card and tied it in a bow. I then adhered the verse to the card on a slant, and then attached the cross using foam squares to add some dimension. To finish it all off I printed the wording "On your Baptism" on the front using the same font that the Bible verse was printed in. I cut it out and then mounted it on the same blue cardstock as previously used and attached it flat to the right left hand bottom corner of the card. 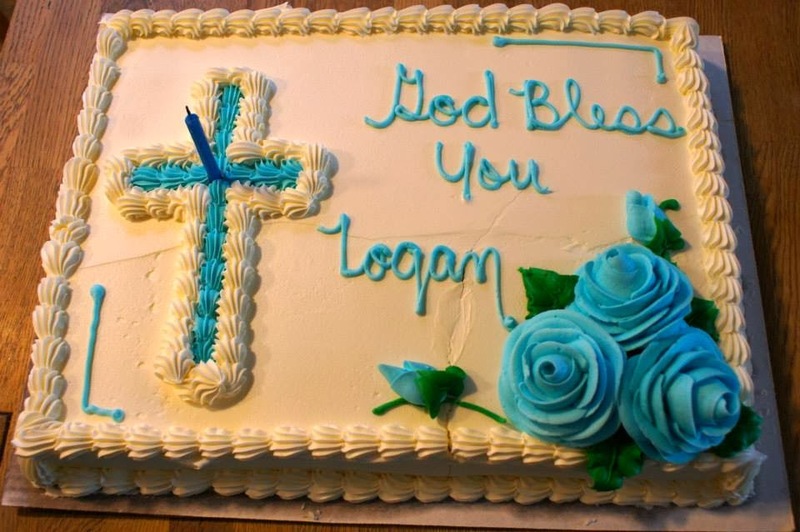 The funniest thing about this card is that it matched so closely to the cake that his mom had ordered for his baptism. I hadn't seen the cake till that day and my Godson's mom hadn't seen the card until at the party after his baptism. God was in control of this one. I will also add below a picture of the cake so you can see. Who would have thought that the cake would have been white and blue just like my card, and the placement of the cross was almost the same spot as it was on the card. Singing "Happy Birthday to YOU"